Sculpture art literally adds another dimension to modern art, that being the space that it occupies. The artist has an idea of what he wants to communicate, and the colors he wishes to use, the shapes he wishes to use, and then it all is extended into space, and whether it is small or large it is doing something different than a painting because of this. Light moves through and around a sculpture, and it can be freestanding in a variety of different spaces. 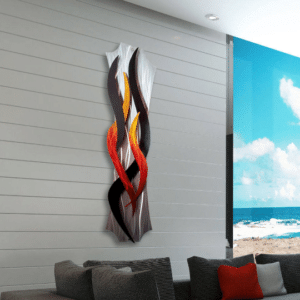 Whereas a flat two dimensional piece of art must be approached to be experienced, a sculpture is, in a very real sense reaching into your space and changing it. Art is all about transformation – from the whole process that begins with an idea and moves from planning stages to completion, to the transforming of the raw materials into the final piece, and then the way that the completed sculpture transforms the space, and anyone thereafter that interacts with it. Investing in a piece of art is investing in the space that you are changing, and is investing in a relationship with the art. It starts when you look at a piece of art and feel a desire for it, or for a commissioned piece that you want from the artist, and as you live with it through the years that relationship is going to develop. What was the artist trying to say? How does this make me feel? What was happening when I bought this piece of art?